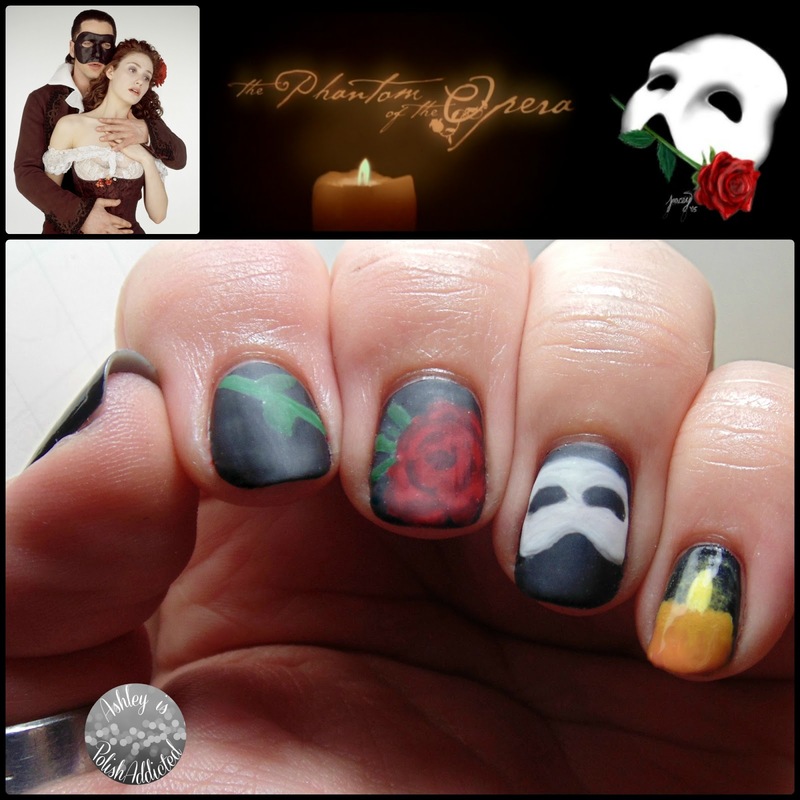 I am a big Phantom of the Opera fan. It was one of those things that I wasn't sure I would like before I watched it but I fell in love with it. I haven't gotten to see the live version yet, but I will one day! 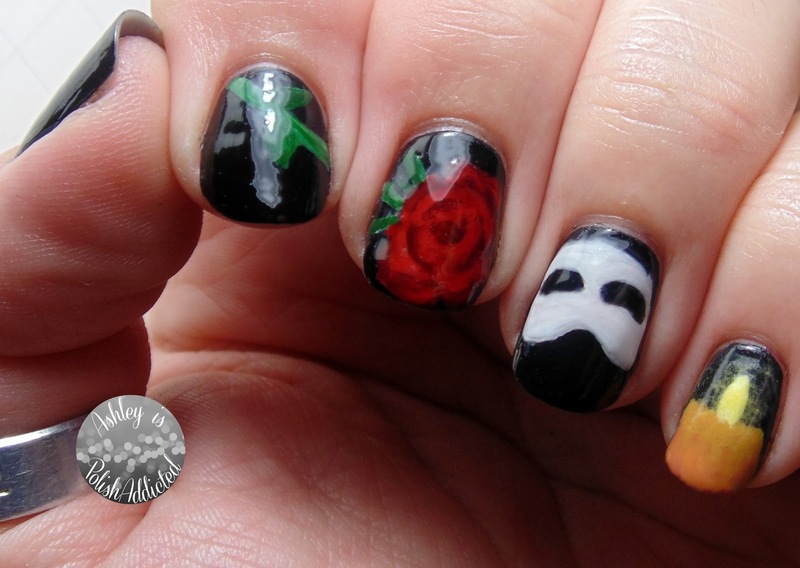 I have been wanting to do a Phantom of the Opera manicure for years. I just never had the confidence to try, or the "know-how" to really even know where to start. I figured the mask was a good place to start! I originally attempted the "vertical" mask that is worn throughout most of the movie. (Referring to the 2004 version starring Gerard Butler and Emmy Rossum, which was the first version I saw and is still my favorite.) 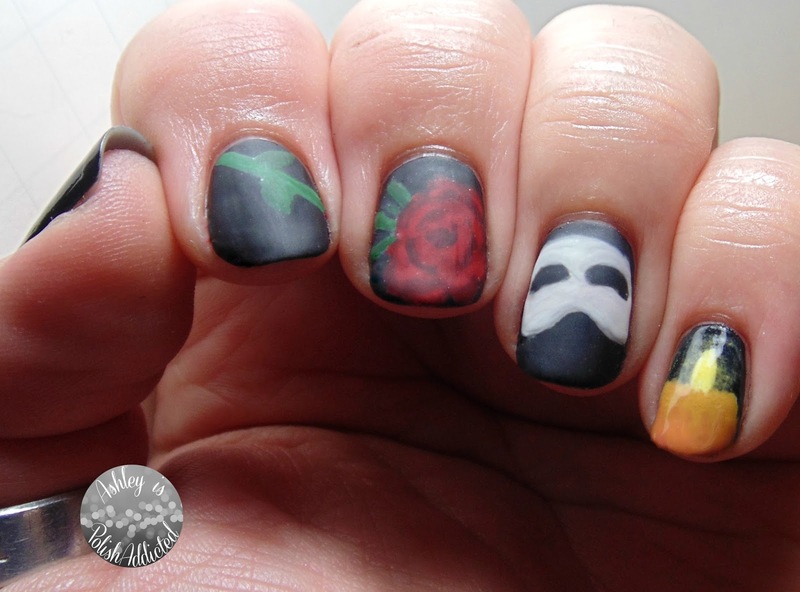 That version of the mask just didn't look right to me on my nail so I went for the more traditional version of the mask. That version is in this movie as well, as seen in the photo below. I decided to matte all of the fingers except the candle (since the candle is glowing). All of the details in this manicure were done with a nail art brush except for the glow of the candle. To create the glow I created the color by mixing Nails Inc. Hampstead Gardens and white. Once it was mixed I took a clean make up wedge, dampeded it with straight acetone and then dipped it in the polish mixture. I then lightly dabbed it on my nail. The acetone helped thin out the polish so it didn't cover the design on my nail. Overall I am happy with how it turned out. I also really like it shiny and can't decide how I prefer it. Since I used so many polishes in this manicure, and several are polishes that I mixed together, if you would like to know a specific polish just ask in the comments and I will happily answer! I love these! I tried to come up with a design to wear when I saw the touring production this spring, but couldn't get the mask to look right. Thank you! It did take me awhile to get it where I was happy with it! This is amazing. You did a wonderful job!